(해당 임상시험은 http://www.clinicaltrials.gov 에 NCT02243020 번호로 등록되어 있다.). 대상자들은 모두 unilateral supratentorial ischemic stroke 병력이 있었으며, stroke 이후 4개월 - 5년 지난 시점에서 randomization 하였다. 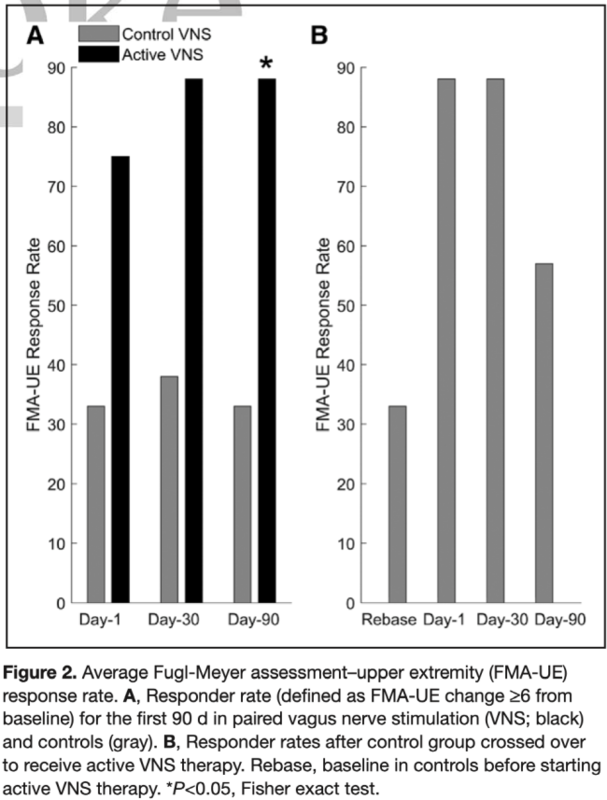 모든 연구대상자들은 VNS device 삽입 수술을 받았고 수술 전에 baseline 평가가 이루어졌다 (Fugl-Meyer assessment-upper extremity, Wolf Motor Function Test). device 삽입 수술 이후 1주 가량의 회복기를 거친 뒤, 대상자들은 active VNS group 과 control VNS group 으로 randomization 되었다. randomization 그 다음날 부터 ‘in-clinic’ rehabilitation 이 시작되었고 6주 동안 주당 3번의 상지재활치료가 진행되었다. active VNS group (n=8) 에 속하는 환자들의 경우에는 0.8mA 의 전류가 삽입된 장비를 통해 제공되면서 상지재활치료가 진행되었고, control VNS group (n=9) 의 경우에는 0mA 의 전류가 장비를 통해 제공되었다. 6주간의 ‘in-clinic’ rehabilitation 을 마친 후, 모든 대상자들은 home exercise 를 진행하였고, 30일간의 home exercise 동안에는 모든 대상자들이 0mA 의 전류를 제공받았다. 그 이후에는 active VNS 그룹 대상자에게는 0.8mA 의 전류를, control VNS 그룹 대상자에게는 0mA 의 전류를 제공하면서 home-based exercise 를 하도록 했다. 그러는 동안, 결과변수는 재활치료 종료 후 1일, 30일, 90일 째에 평가되었다. 90일째 이후에는 control VNS 그룹 대상자들이 0.8mA 의 전류를 제공받으면서 6주간의 ‘in-clinic’ therapy 를 받았고 (cross-over design), 그 이후의 평가도 ‘in-clinic’ therapy 종료 후 1일, 30일, 90일 째에 평가되었다. ‘in-clinic’ therapy 종료 후 1일째에는 active VNS 그룹에서 7.6점의 FMA-UE score 의 상승을 보였고, control VNS 그룹에서 5.3점의 FMA-UE score 상승을 보였다. 재활치료 종료 후 90일째에는 active VNS 그룹에서 9.5점의 FMA-UE score 의 상승, control VNS 그룹에서는 3.8점의 FMA-UE score 의 상승을 보였다 (Figure 1). 90일째 임상적으로 의미있는 FMA-UE score 상승분 (6점 이상의 상승) 을 보인 환자의 비율은 active VNS 그룹에서 88%, control VNS 그룹에서 33% 였다 (p=0.03, Figure 2.). control VNS 그룹의 경우 crossover ‘in-clinic’ therapy 이후 1일 시점에서의 FMA-UE 점수 상승이 baseline 에 비해 9.8 점, 90일 시점에서의 FMA-UE 점수 상승이 baseline 에 비해 9.7 점인 것으로 나타났다 (Figure 2.). 3개의 serious adverse event (SAE) 가 생긴 것으로 보고하였다. 세 경우 모두 implantation surgery 와 관련된 것이고, 첫번째의 경우는 implantation wound infection 때문에 발생하였고, IV antibiotics 로 해결되었다. 두번째의 경우는 intubation 으로 인해 short of breathness, dysphagia 가 생긴 경우이고 이후 회복되었다. 세번째의 경우는 vocal fold palsy 로 인해 hoarseness 가 생긴 경우이다. stimulation 에 의해서 생긴 SAE 는 없었다. Kimberley TJ, Pierce D, Prudente CNN, et al. 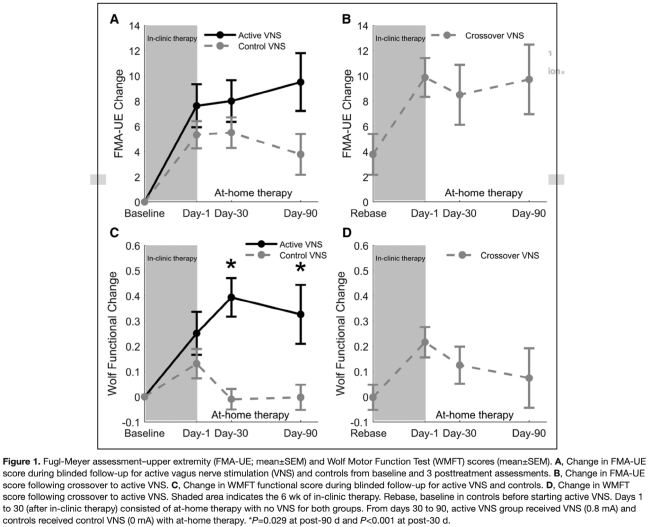 Vagus Nerve Stimulation Paired With Upper Limb Rehabilitation After Chronic Stroke.